We will roll-out the new add-on slowly, so you might not automatically get the update for quite some time. If you want to get the update now, uninstall the add-on and re-install the new one from the Google web store. Developing this add-on was quite expensive, so we cannot release it as Open Source. The old add-on is still available here. The update for Firefox will follow, but I cannot promise any dates yet. So I’ve installed the extension but it does not work for me. 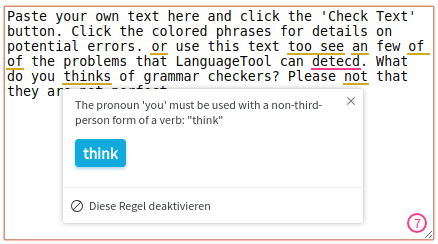 “Check Grammar and spelling on this site” is on, my language is English and I tried it on two fields: textarea (https://www.w3schools.com/tags/tryit.asp?filename=tryhtml_textarea) and tinymce. I have a friend that reported the same problem. I’ve tried to uninstall and install again but that didn’t help. I use latest version of Chrome. Ok, it seems to work on some other web-pages. So maybe those couple of pages were just not supported. That page uses spellcheck=false and the add-on currently accepts that and doesn’t appear. We’ll add a better UI for that soon, so the user understands the issue or can overwrite the page setting. Maybe I misunderstood you: when you said it doesn’t work, didn’t it work for you at all, i.e. didn’t you even see the underlines for errors? Have you tested in the source code view on the left or the rendered HTML on the right? So I’ve tried it quickly on two pages and both of them didn’t show any signs of LT in the text fields. So I checked button at the top and checked context menu but found nothing to perform the check. I must say on pages that it works on everything is cool, I see pretty visible indicator and results (although I would go for different color for grammar errors, it’s a bit too subtle now - but that’s my personal preference). If we add some indication for cases when checking is off that would be very helpful. Otherwise, looks great, thanks for the upgrade! P.S. just noted one thing - it checks Ukrainian wikipedia page properly but language stays English, if I switch to Ukrainian it again checks properly but after check is done resets back to English. Are the pages you tested public, so I can try them? Also, if your add-on version is not 2.0.3, please uninstall and re-install to get the update. In the future, updates will be automatic again. I’ve updated to 2.0.3 and the language is now showing properly. The other that didn’t work is comment field on this page https://www.pravda.com.ua/news/2018/10/12/7195026/ (I didn’t find spellcheck attribute there though). The add-on is auto-detecting the language on every sentence, isn’t it? That’s fine, but there are some undesired results. I don’t know how frequent they are. For example, the Catalan short sentence “Uns quants exemples.” is analyzed as Portuguese (with two spelling errors!). Please let me know what version you have. If it’s < 2.0.4, please uninstall and reinstall. You should get 2.0.4 then, where this issue is supposed to be fixed. If it’s not, please let me know. With 2.0.4, there is auto-detect, but only one language for the whole text. That’s on purpose for now to avoid the issue you had with 2.0.2. I’m not sure yet how to get the best of both worlds. Maybe just use per-paragraph language detection if the paragraph exceeds a certain length so the detection becomes very reliable? I’ve tried new Chrome addon (2.0.4) on comment field in Facebook for Ukrainian and for some reason only grammar errors are highlighted, spelling errors are ignored. E.g. for “Десь там прійшов матеріял.” only 4th word is highlighted (alternative spelling), 3rd one should be caught by speller module. Thanks for the report. I can reproduce and have added it to our to do list. (It’s not limited to Facebook, BTW). At the moment I only tried it in Catalan language, it looks fine and works better. I understand that in short sentences it confuses language but its not big a problem for me. Now I just installed 2.0.4 version and tried the short sentence “uns quants exemples” and is analyzed as Portuguese. Tried “Ara poso uns quants exemples” and is analyzed as French. Finally, I write “Catalan: Ara poso uns quant exemples” and checks OK in Catalan. This is now fixed in 2.0.5. You might get it automatically, otherwise you’ll need to uninstall and re-install. It conflicts with Grammarly plugin. So I opted out to turn LT plugin off, in general Grammarly detects more problems in English. It would be nice if they could work simultaneously. Note that Grammarly plugin has more that 10M of users, while for LT it is just 140k. However, LT is the best available choice for my native language for in-browser writing.